Nebraska (17-6, 8-2 Big Ten) beat Illinois (9-15, 0-10 Big Ten) 62-47 Thursday night, but boy oh boy was it a tough affair to watch. Chalk it up to good defense if you want, but the Illini looked hapless. Over the course of 40 minutes they missed 43 of their 59 shots, turned it over 15 times, committed another 18 fouls and managed to set a Husker opponent record for fewest points scored in a half (10) in program history. If the 10-point half sounded bad, consider that Illinois scored one whole point in the second quarter and missed all 12 of their shots from the floor. Women’s college basketball moved from halves to quarters at the start of the 2015-16 season and the one point scored is a program low for Nebraska opponents since. “It’s pretty rewarding,” sophomore Nicea Eliely said of being able to look up at the scoreboard and see such a low number. While there was generally a feel-good attitude surrounding the Huskers’ defensive performance, the offense was another story entirely. Coming off a season-high 98-point outing against Iowa last Sunday, the Huskers opened hot again, connecting on five of their first 10 shots from the field. With 3:43 to go in the first, the Huskers had a 14-7 lead and Illinois hadn’t hit a shot in almost five minutes. Nebraska missed 17 of its final 20 shots to end the half, visibly affected by a long and athletic Illinois outfit. Fortunately for Williams and her team, Illinois’ cliff-dive came in that second quarter as well and Nebraska entered halftime with a 16-point lead. “You’ve got to credit Illinois’ defense for that,” Williams said. “They just did a good job of kind of forcing us into some quick shots, ugly shots and to play a little bit ugly. 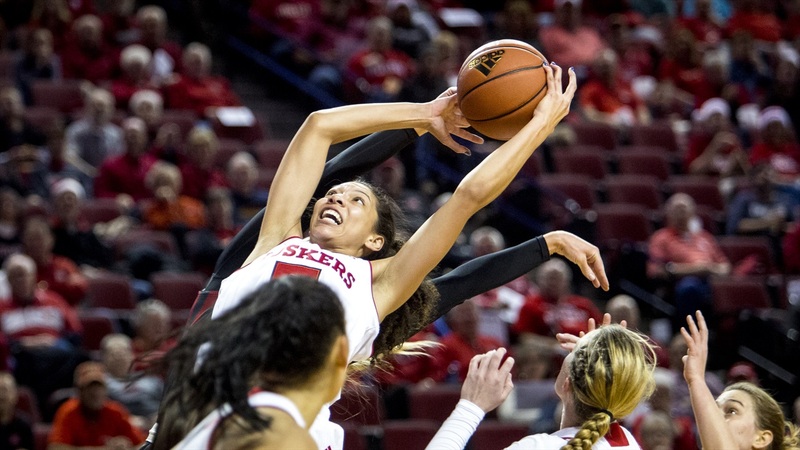 Things were better in the second half for the Huskers, who scored 36 points at a 56 percent clip and depth again proved to be an advantage for Big Red. Williams went 12 deep on her bench and was rewarded with 10 scorers. Eliely led the way with 11 points, the only Husker in double-figures, but Nebraska didn’t need a go-to bucket getter on the night. Illinois pulled to within 11 late in the third quarter but never felt like a true threat to make a serious run at the Huskers. Now the attention shifts to No. 11 Maryland. The Terrapins are 18-3 on the season, 7-1 in league play and looking for their fourth-straight Big Ten conference title. Forty percent shooting won’t get it done against the Terps, 53 percent from the free throw line won’t get it done, 17 turnovers won’t get it done. But the Huskers know that.